Every year, I have these grand intentions of getting ahead of the holidays, of being prepared so I can be present. And every year, it still feels like a race to the finish line. Instead of enjoying the season of giving, I have meltdowns at Target over wrapping paper (there are just so many options!) and I always worry if my gifts are enough. It’s taken me twenty-eight years to realize that this form of giving is simply not my love language, that to me, love is shown by spending quality time with one another and that true quality time is never complete without good food and a slightly expensive bottle of wine. Because nothing says, “I am grateful for you, for this season and for life” like a big feast and a cherry pie. And lucky for me, health and wellness blogger, Jennifer Diaz, agrees. Let me just say that everyone needs a Jen in their life - someone who is endlessly positive, optimistic and not only helps you dream bigger, but helps you bring those dreams to life. If you don’t already, I highly recommend you follow her on Instagram for daily doses of inspiration, beautiful photos, healthy recipes and above all else, honest writing. I met Jen earlier this year and it didn’t take long for us to start dreaming up this holiday collaboration. 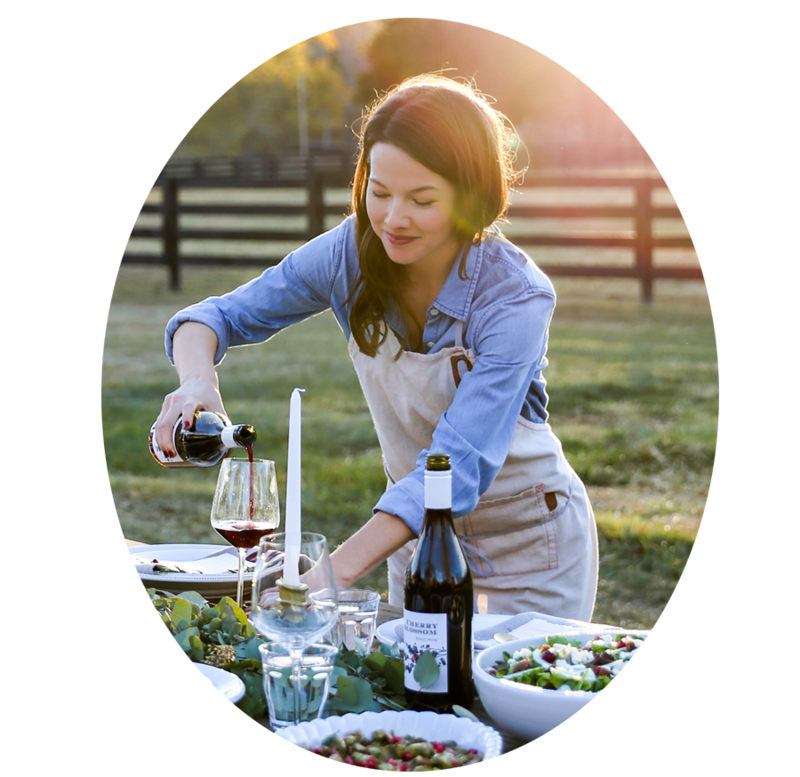 Set on a sprawling farm in the rolling hills of Tennessee, we wanted to create a cozy outdoor fête that invited guests to take a moment out of their hectic schedules to pause, reflect and spend intentional time with one another. We wanted the outdoor tablescape to not only complement the landscape’s simple, rustic nature, but also feel warm and inviting. We loved the texture and vibe of the old farm table and the way the benches encouraged our guests to sit a little closer. To create a sense of warmth, we introduced fur throws on the benches, used soft earthy linens and wove a garland of eucalyptus around tapered candlelight. These days, you can have so much fun with flatware and we looked no further than Nashville’s renowned 12th Table. We loved the Sande Collection’s sleek, modern design and how the warm, muted gold popped subtly off the table. To keep in the holiday spirit, Nashville calligrapher Amy May of Amy May Paper wove red silk ribbon through her beautifully handcrafted menus, adding the perfect touch of subtle, chic holiday decor. It was an evening I’ll never forget and one that made me believe in the holidays once again. Whether you have a table for twelve or a coffee table for four, I encourage you to gather around with your friends and family and encourage one another to live purposefully this holiday season. I promise you these are the moments we will all remember, the recipes we will continue to cherish and the events we most look forward to in the end.